California is blessed with easy access to fresh seafood. Los Angeles in particular, is a hotbed of reasonably cheap sushi restaurants and upscale seafood-centric establishments. Koreatown’s EMC Seafood & Raw Bar meets diners in the middle with quality offerings at affordable prices. Tables fill up quickly and there is often a wait — so head there early (no reservations). Menu standouts include their seafood tower, lobster roll, garlic clams, and my most favorite dish: Uni Pasta. The bar is a hit among the happy hour sect with a couple of interesting house cocktails and a couple of craftier beer options — but with The Walker Inn & Normandie Club a block away, I’d skip the booze and focus on the shellfish. 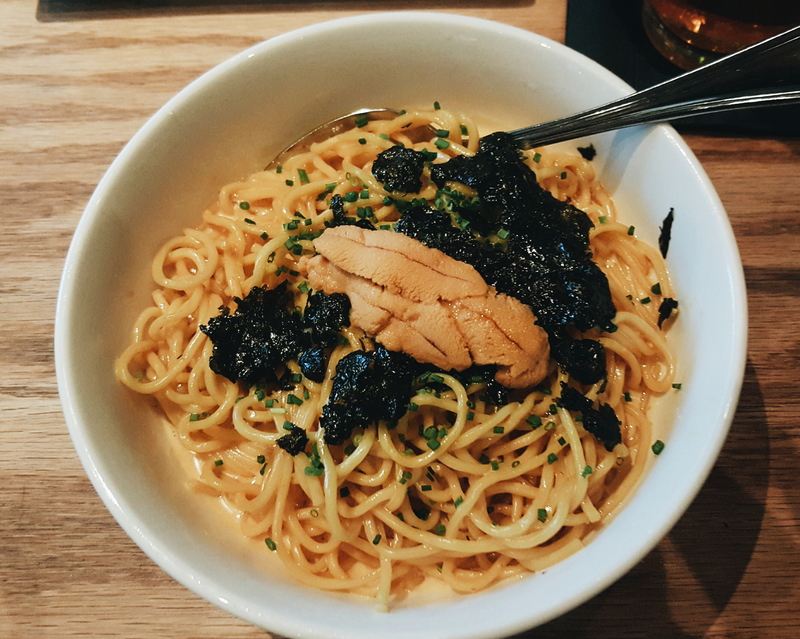 Uni Pasta with a creamy sauce, seaweed, fresh chives, and luxurious uni. Yum. EMC is definitely top of my restaurant bucket list next time I’m in LA…!